Many thanks to the folks at Boxcar Press for their wonderful write-up on Blogxcar! Impractical Labor in Service of the Speculative Arts (ILSSA), a project co-founded by me and one of my all-time favorites, Emily Larned, was recently featured in the NYFA Current magazine and the Hello Craft blog. Thanks to authors Eleanor Whitney and Mimi Kirk for their thoughtful questions! 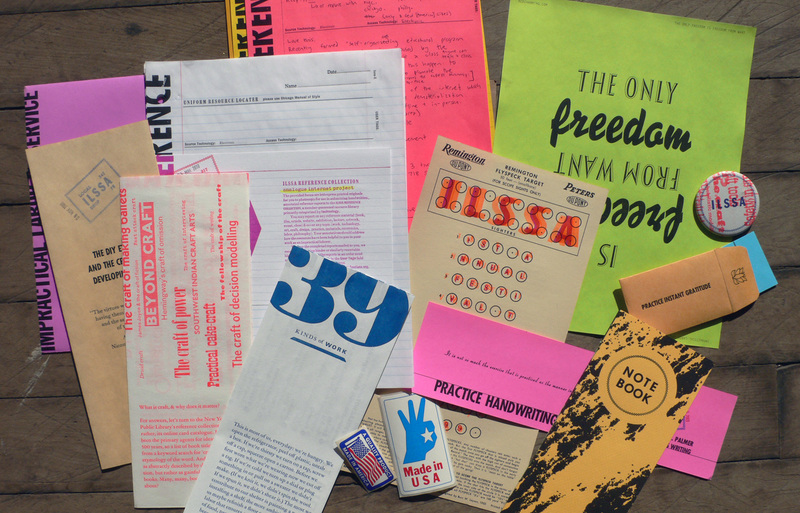 These interviews tap into the State of the ILSSA Union, a membership organization for those who make experimental or conceptual work with obsolete technology. Just returned from 2011 CBAA Conference, and the weekend was a blast. Highlights included presentations by Emily Larned, Matthew P. Brown, Kristin Carlson, Kristen Merola & Tate Shaw, Tatiana Ginsberg, Frank Brannon and Denise Bookwalter. In addition, Andrew Huot presented about his experience with on-line bookbinding instruction, which was a fascinating model to consider. Following my presentation, entitled Relational Continuum: The Book as ‘Lasting Encounter,’ our panel entertained a lively discussion regarding socially engaged practice involving the book form, which I hope to continue in the coming months. In service of that goal, I will be establishing a wiki that hosts an evolving list of critical questions, beginning with those that emerged from my conversations with Temporary Services, Book Bombs, ILSSA and the CBAA panel attendees. Keep your eyes open for that link, as well as a paper from Emily Larned, which she plans to compile from her presentation, entitled Splits, Trades, Reviews, & Distros: Zine Culture As Model. As usual, I returned from the conference feeling inspired, exhausted, and bit nostalgic. There’s nothing quite like spending three straight days with those who speak your language fluently! Join me this Sunday, December 5th, from 12-6pm at The Big Crafty, where I’ll be tabling for ILSSA and featuring the work of several ILSSA members! The event takes place at Pack Place in downtown Asheville, NC. In addition to ILSSA publications, our table will feature work from Blackbird Letterpress, Flatbed Splendor, Robert Howsare, Polly Johnson, Melanie Mowinski, Primrose Press, Red Charming, and Erin Sweeney. Hope to see you there! Impractical Labor in Service of the Speculative Arts (ILSSA) recently presented at the Mid-America Print Council Conference. We were honored to join a panel of our colleagues from Preacher’s Biscuit Books and FSU’s formLab/Small Craft Advisory Press for a discussion that focused on technology and the role it plays within these three collaborative projects. For ILSSA, it’s fairly straightforward. We are a membership organization for those who make experimental or conceptual work with obsolete technology. We’re a motley crew of seed savers, adobe oven builders, weavers,letterpress printers–united by the singular fact that we value discarded innovations as relevant tools for making. One of our members, Local 917 Shop SE, recently started a blog, which evidences the incredible, beautiful creations that can be born of such an obsession. Now that’s what we’re talking about.